Humility and wisdom usually come with age and maturity and so too do wisdom teeth. You can expect your first molars to appear from age six, your second molars around age twelve and then your third molars, commonly called ‘wisdom teeth,’ emerge anytime between the age of seventeen to twenty-five. Interestingly this seems to coincide with the transitional period in your life when you are maturing from adolescence to adulthood; during which time it’s assumed you gain a little more wisdom too! So, why do wisdom teeth need to be removed? The most common problems that necessitate the removal of wisdom teeth include tooth decay, infection, crowding or damage to surrounding teeth due to insufficient space. 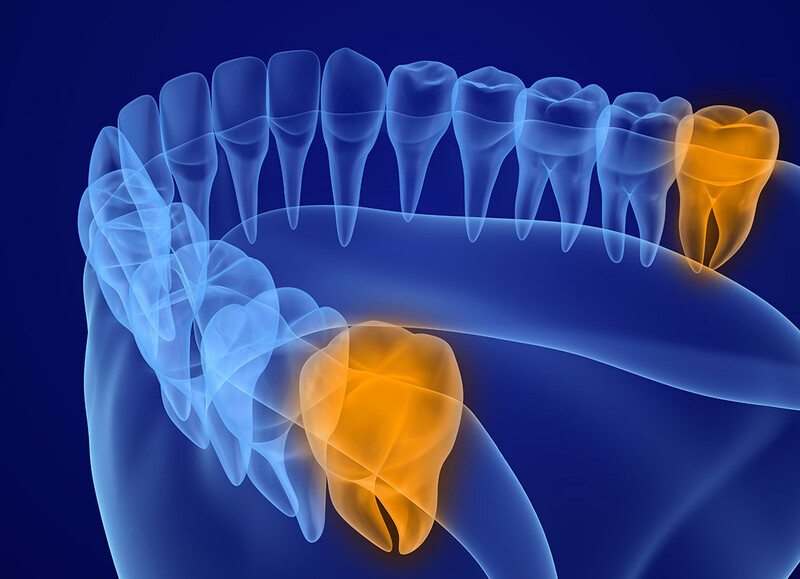 Impacted wisdom teeth are particularly problematic. This occurs when they do not fully emerge from the gums or are partially obstructed by other teeth or the jaw bone. This poses a risk of infection (otherwise referred to as pericoronitis), which occurs when food and bacteria get caught under the gum flap covering the wisdom tooth. If untreated, this is likely to cause an abscess, which can be extremely painful and dangerous. To avoid unnecessary pain and damage to your teeth, a preventative treatment plan is always the best strategy for dental health. It’s therefore important to have your teeth checked regularly, particularly during your teens and young adulthood. Regular six-monthly oral check-ups and the use of x-rays enables your dentist to monitor the development of your wisdom teeth to determine if they are likely to cause any problems and whether they need to be removed. Bearing in mind that it is much easier to extract wisdom teeth when you are younger because the roots of your teeth are not yet fully developed and the bone around your teeth is less dense. Recovery is also much quicker. On the other hand, if your wisdom teeth are correctly positioned and are not causing any pain or dental problems then it’s likely they can remain in place without being disturbed! For more information about Wisdom Teeth removal and treatments, click here. If you are feeling any sign of discomfort or swelling around your wisdom teeth, we strongly recommend you get them checked as soon as possible. Our friendly team of dentists at The Dental Lounge offer expert treatment at the best price in the least amount of time. We also have some great specials including our ‘new patient’ offer (conditions apply), so why not call The Dental Lounge today to book a consultation - phone (07) 5580 8855; or contact us via our website. We look forward to meeting you.